“Following the discovery of Your Picture Framer (Steve) last year we have just had our third project finished and again we are delighted with the final product. I now have an amazing looking room with 2 great festival t-shirts, tickets and photos displays which are commented on by everyone who comes to visit and another piece with photos and tickets on our stair case- can’t think of a better way to remember a great day out! Can’t recommend enough and know we will be returning again and again. I first met James when he was trying to put together a surprise birthday present for his wife, Caroline. He visited the workshop with a bag containing a t-shirt, a couple of wristbands and tickets from an Iron Maiden Concert they had both attended in Prague some years before. The end result was a very happy and surprised Caroline on her birthday. 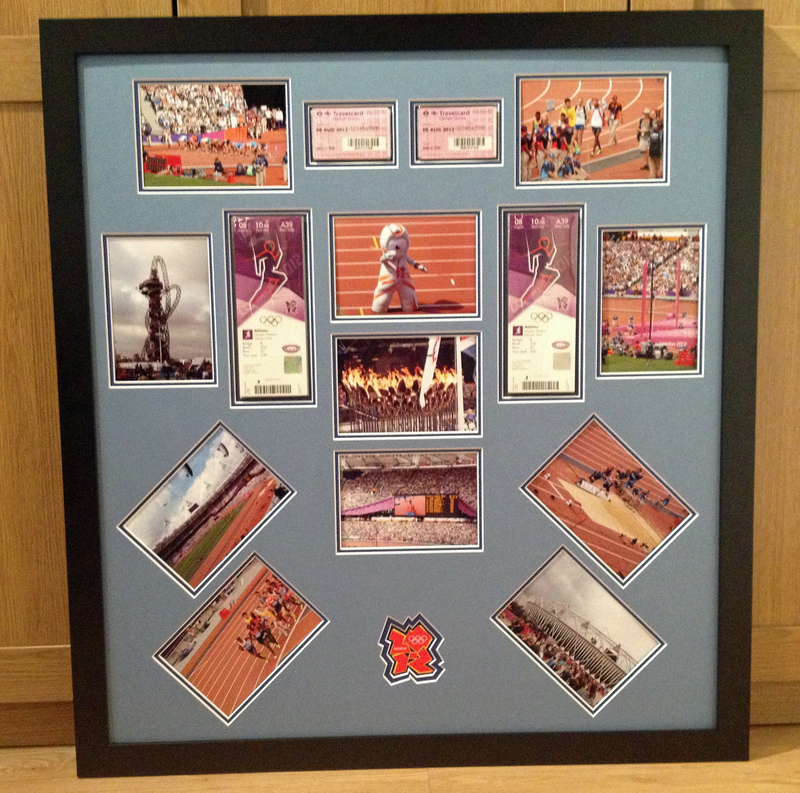 Both Caroline and James were lucky enough to spend a day at the Olympic Games last year and presented us with a bunch of photos, tickets etc to put into another frame. 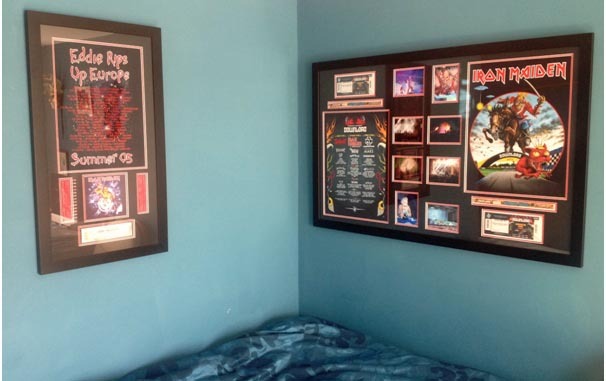 A few weeks ago Caroline emailed and asked if we could visit them as they had another little framing project following their trip to the Download Festival at Donnington. This frame is about 1.3 metres wide and contains a couple of t-shirts, tickets, wristbands and photos (bit of a theme here). I would like to thank Caroline and James for their very kind words and the opportunity to produce something that will prolong their memories of some special events. 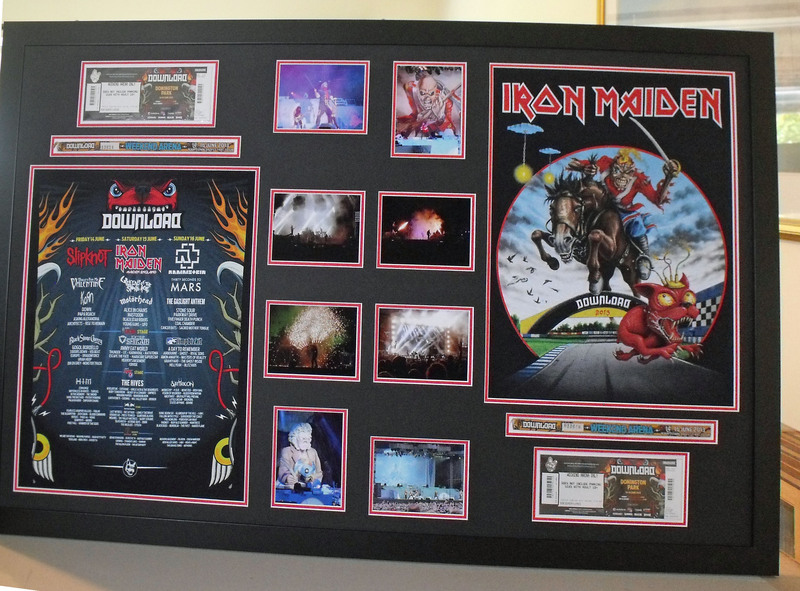 Below is a photo of the room where the two Iron Maiden frames hang.